Professional basketball stars are known for not playing defense, having outlandish contracts, and blowing all their money on lavish houses, cars, and parties. 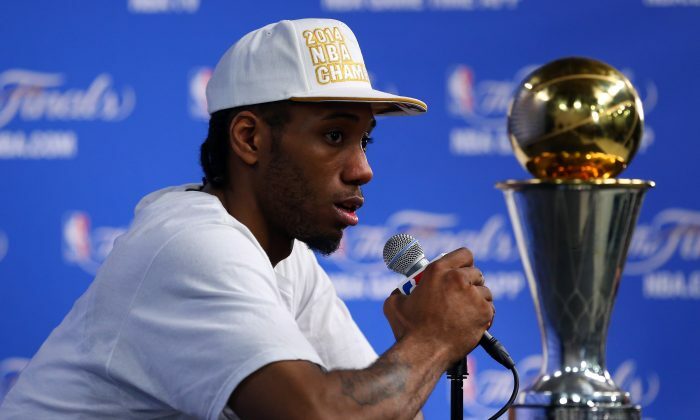 It’s safe to say that San Antonio’s Kawhi Leonard is not your ordinary basketball star, according to a somewhat rare interview the Spurs star gave to Sports Illustrated’s Lee Jenkins. Apparently the 24-year-old Leonard, the NBA’s 2015 Defensive Player of the Year who is signed to a five-year, $94 million extension, still drives a 1997 Chevy Tahoe (nicknamed Gas Guzzler). In addition to driving an SUV that’s nearly two decades old, Leonard recently panicked when he lost his free wings coupons from his lone sponsor, Wingstop. Fortunately, the chicken wing chain restaurant replenished his supply. As a high school player, the selfless Leonard refused to correct an official scorer who kept crediting points he scored to a teammate. “Doesn’t matter,” Leonard told his mom. Leonard, who attended lesser-known San Diego State over UCLA and USC because the Aztecs recruited him first, had his college coaches on edge all during his recruiting process simply because he was difficult to reach over the phone, leaving them to worry he’d renege. Not an active social media presence then or now, Leonard was a second-team All-American as a sophomore after leading Steve Fisher’s squad to a 34–3 mark. A draft-day trade with Indiana netted the Spurs the 6-foot-7-inch, 230-pound small forward, who was selected 15th overall. 3-year-old Riley Curry is the ultimate show-stopper.